INDIANAPOLIS — Crime is an issue in downtown Indianapolis, right on Monument Circle. Indianapolis City Council President says they and the Indianapolis Metropolitan Police Department are trying to get a handle on the rising crime in this area. The council has been talking about how to address panhandling, homelessness and crime for several months now. Businesses on the circle, although, say they need the help now. One downtown business owner, Barry Widduck of EZ Park Indianapolis, said something needs to be done before things get out of hand. "This is the circle. This is the crown jewel of Indianapolis. This is what people come to see. This is our capital city of Indiana," said Widduck. "... Something needs to be done, and done right away, before it gets totally, completely out of hand and either somebody gets hurt or worse." 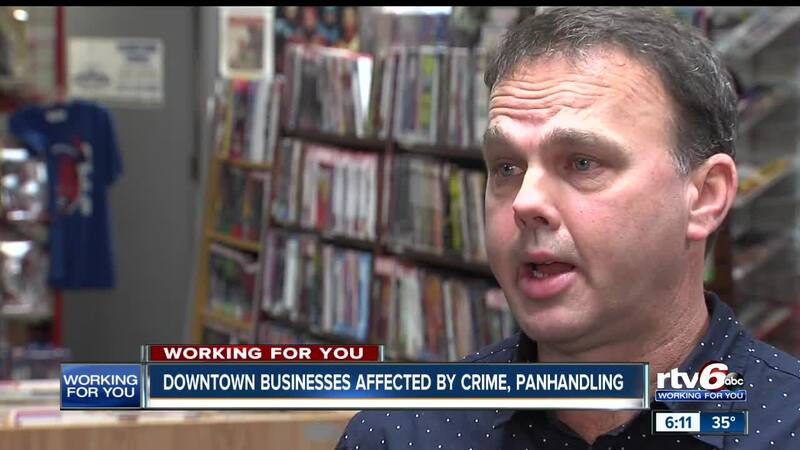 Doug Stephenson, co-owner of Downtown Comics, said Indianapolis officials need to get this problem figured out. "City-county council needs to step up, and the mayors office needs to agree — they all need to figure out how to address this situation," Stephenson said. "We are not talking about throwing homeless or panhandlers in jail. What we're talking about is getting the crime element off of the streets." Police say they're doing all they can do. Panhandling and sitting on the sidewalk isn't illegal. But they've added extra patrols throughout the downtown. The police also have undercover officers working to address aggressive panhandling and drug dealing. City-county council president, Vop Osili, says they plan to address the business owners frustrations with funding through a new proposal. The proposal would extend additional hours on parking meters from 7 a.m. to 11 p.m. across the city Monday through Saturday. "Part of our initiative is to provide jobs and training for individuals who are panhandling, so that they've got choices. So they have something that is far more stable than asking people for money," said Osili. "And with the housing wraparound services, we will be addressing the homeless issues and the addiction issues etc. I think we will see a significant transformation of our downtown in the coming months as we move forward." The city-county council will vote on the new proposal that would create additional hours on parking meter January 7.